A recently published Apple patent describes a "Dual display equipment with enhanced visibility and suppressed reflections" and the device pictured in it looks like a MacBook with an OLED touchscreen area that replaces the traditional keyboard and trackpad combination. Lenovo tried this with the Yoga Book and it apparently failed, so it remains to see if an Apple MacBook with a touchscreen keyboard hits the market or not. Thanks to its excellent tactics, Apple was always able to turn technologies that others failed to market properly into great successes. There is no need to look far back into the past because we have two recent examples. Both involve Lenovo and a touchscreen-related technology. In the first case, Lenovo failed to turn the touchscreen Function Key row into a success with the X1 Carbon, while Apple used the same approach, called it the Touch Bar, and it was a success. Now, the touchscreen keyboard that Lenovo used in the Yoga Book surfaced in a patent uncovered by Patently Apple. This patent has a rather shady title that mentions a "dual display equipment with enhanced visibility and suppressed reflections." 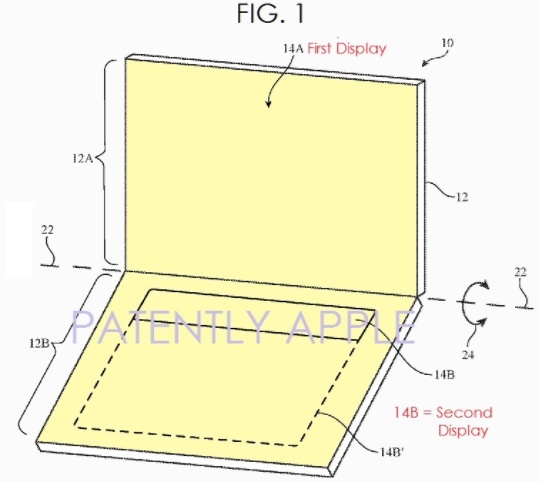 The two distinct devices it describes could be a next-gen MacBook and a future iPad. The MacBook has two touchscreens that are connected using a hinge. In the second case, the tablet is standalone, and the touchscreen keyboard comes as a detachable accessory. According to Patently Apple, this tablet + touchscreen accessory combination could be "a classic 2-in-1 device" or a new iPad Pro. In addition to the above, this patent also mentions that the user of these devices will be able to view content in outdoor conditions while wearing sunglasses. 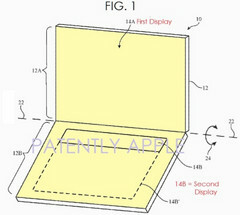 Since the patent is quite old, remains to see if Apple forgets about it or moves on with this technology. The patent was originally filed in the second half of 2015, but it was published by the US Patent and Trademark Office yesterday. Do you think that Apple could pull this off, turning another failed design approach by Lenovo into a success? Feel free to share with us your thoughts by submitting your comments below.